Glossy magnetic paper for your best photos! With this magnetic paper (glossy) you can turn your photos into individual fridge magnets in no time. Print photo on this paper, cut it to the desired size, attach it to a metal surface - done! Important: Magnetic paper is very thin and therefore will never reach the adhesive force of a magnetic sheet. To avoid disappointments, we recommend cutting large enough pieces (at least 10x10 cm) and attaching them to totally smooth surfaces. A set of glossy magnetic paper contains 10 sheets. 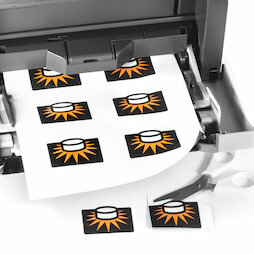 The magnetic paper works with almost all laser printers and copiers as well as inkjet printers and is so thin, you can cut it with regular scissors. Caution: Not suitable for a thermal printer! Besides printing, you can write on the paper with waterproof markers. Regarding labelling, please read our extensive FAQ. Magnetic paper is not suitable as a magnetic base for magnets! The magnets would even demagnetise the paper. A good base for magnets are our magnetic boards. 1 pc. 30,40 EUR ea. This will ensure a good printout that will not smear after drying.